Please note if you are already a GTrek II owner that software updates are now available for download. You will first need to register your logger which you can do by clicking here or using the link below. 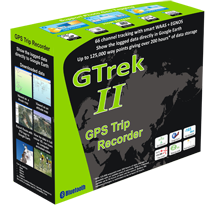 GTrek Track is now available as an update to V3 software. Additions for the "Track" version are numerous but include features for track-day enthusiasts and circuit training. Click here for more details. If you are a registered user click on "Software Updates" link below and download this code now. GTrek monitors your movement and allows you to create a highly detailed graphical record of where you have been. Perfect for the bike enthusiast both amateur and professional, the product uses GPS satellite technology and records the users' exact position at specific intervals, to build up a picture of movement. This can include how far, how fast and how high the user has travelled. Better still, the product comes with software to allow you to see where you've been using Google Earth's topographical mapping.